We are HUGE fans of Universal Studios and Islands of Adventure. We have been going there since our son was 2 and every year there is something new and fun for him to enjoy. First off, I love that they have misting fans all over the place. In the middle of the day, that Florida sun can be brutal. Of course, we do usually bring our own portable misting fan whenever we go to theme parks, but here we don’t need to. For the 7 and under set, our favorite attractions at Islands of Adventure are Seuss Landing, the Jurassic Park Discovery Center, Camp Jurassic and Harry Potter. 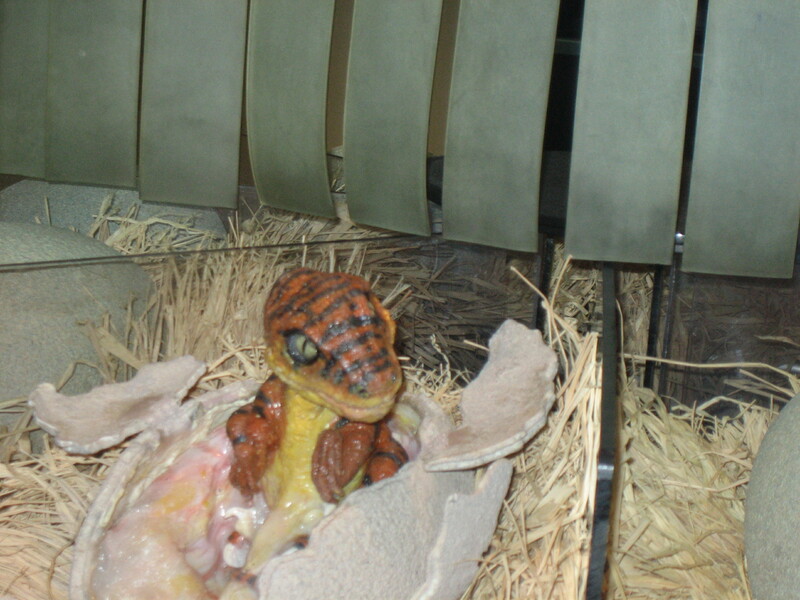 Jurassic Park Discovery Center: Watch the hatching of a ‘new’ baby dinosaur and the kids get to help name it! The kids who’s names were chosen each get a copy of the baby dino’s birth certificate. The animatronics on the baby dino are pretty convincing. It’s pretty cool for toddlers on up. You can see a photo of the baby my son helped name above. Camp Jurassic: Ok, fair warning… the dinosaur footprints in this playground make some pretty intense dinosaur sounds that freaked out my son when he was 2. Like nightmares for weeks freaked out. Two years later, we went back and he conquered the fear, and found some amusement in freaking out unsuspecting middle-schoolers as they came by. Some of them can jump really high! The rest of the playground area is fun for a wide range of ages… middle-schoolers included. Seuss Landing: Cat in the Hat ride is the spinniest ride they have, and it’s pretty tame. The Sneeches-themed High in the Sky Seuss Trolley Train Ride moves along very slowly. For little kids, this is perfect. Just enough height to be thrilling, not too fast, and not too many twists and turns. All the rides in Seuss Landing are thrilling enough for little kids, and yet safe for them, too. And I’m a mom who can’t do spinny rides, so these are great for me, too. The Wizarding World of Harry Potter: Now that my son is 6 (or was when we were there) he’s all into Harry Potter. He was an early reader, so has read the first book already, and has seen the first two films. That’s enough to make the whole experience amazing for him. We rode the Flight of the Hippogriff roller coaster, and he thought it was a little too fast for little kids. Not for him, of course, he just thought I should tell my readers. And no, he didn’t want to ride it again. 😉 Just strolling through Daigon Alley was super fun… picking out wands and costumes, looking at all the candies and trinkets. No rides needed to make it fun. Me Ship, The Olive: For the younger set, this play ship is super fun. There’s lots of padded places to play, climb and slide. Kids can even spray the riders of Popeye & Blutos Bilge-Rat Barges as they float by. It’s definitely for the 2-6 age group. Ours was a little bored with it the last time, but LOVED it when he was younger. Hopefully this helps dispell the myth that this place is only for older kids. There is truly plenty to do for all ages. And, everything is pretty close (unlike at WDW), which is great if you have teens who want to venture off to ride the big coasters on their own. If you go, you can buy discounted tickets right here. Tip: use your AAA card inside the park for 10% off all meals and souvenirs.